The politcal challenges thrown up to the status quo in Europe in the aftermath of global recession and the Eurozone crisis has prompted a surge of media and think-tank interest in the concept of populism. Although a notoriously slippery term – and one often used in a loose, disparaging sense to describe demagogic promise-making by unsavoury extremist outsiders – most academic researchers concur with the definition of the Dutch political scientist Cas Mudde: an ideological construction that sees politics as dominated by immoral and collusive elites who do down a homogeneous and unsullied People – sometimes by promoting the interests of undeserving minorities. Populists thus offer themselves to electorates as truth tellers, tribunes of the People and righters of wrongs. However, as populism is famously a ‘thin ideology’ whose basic construct needs to filled in and filled out with political ballast from elsewhere. For this reasons populism seems chameleon-like. It can assume many political colourations: from the (much studied) extreme right through regionalism, free marketry and radical left populism. The academic study of comparative populism and the sense that populist movements have been the main beneficiaries of the politics of austerity triggered by the global recession of 2008-9 are brought together in a new collection edited by Takis S. Pappas and Hanspeter Kriesi European Populism in the Shadow of the Great Recession (ECPR Press, 2015). The book assesses the political impact of the Recession by examining pre- and post-crisis fortunes of 25 populist parties in 17 European countries, which are grouped in five regional clusters: Nordic (Sweden, Denmark, Norway and Finland); North European (France, Holland, Belgium, Germany and Switzerland); Southern Europe (Italy and Greece); and Central and Eastern Europe (Czech Republic, Hungary, Poland and Slovakia); and the ‘Anglo-Celtic’ pairing of the UK and Ireland. In Nordic and Northern Europe countries and – with the rise of UKIP – the UK the main populist challengers are radical right or anti-immigrant parties, in Southern and Eastern Europe populism is a more mixed bag comprising conservative-nationalism, radical leftists, technocratic market reformers and hard-to-categorize anti-corruption movements. The depth of the Recession is assessed through a composite index of economic misery combining negative growth, unemployment and public and private debt. However, given the long-time presence of some populist parties – especially parties of the populist radical right in Western Europe – the editors and contributors also consider the possibility that populist parties’ fortunes may be shaped less by economics than by the playing out of longer-terms political crises. In Western Europe, in line with earlier work of Kriesi and other collaborators on the rise a ‘demarcation-integration’ division between the winners and losers of globalization making cultural and identity cleavages increasingly salient. In Southern and Eastern Europe, crisis of politics and governance might be seen as rooted in corruption and weak institutions. This allows countries to be classified (see below) into four categories depending on the relative strength of political and economic crises. However, as a more detailed plotting of their indices (see below) shows Greece and Ireland are outliers in terms of austerity and economic pain. The upshot of their analysis is that while the Recession saw populist parties make electoral inroads in many places (red circles in above visualization) of such post-Recession gains were, with the exception of Greece, Italy and the Czech Republic, limited. 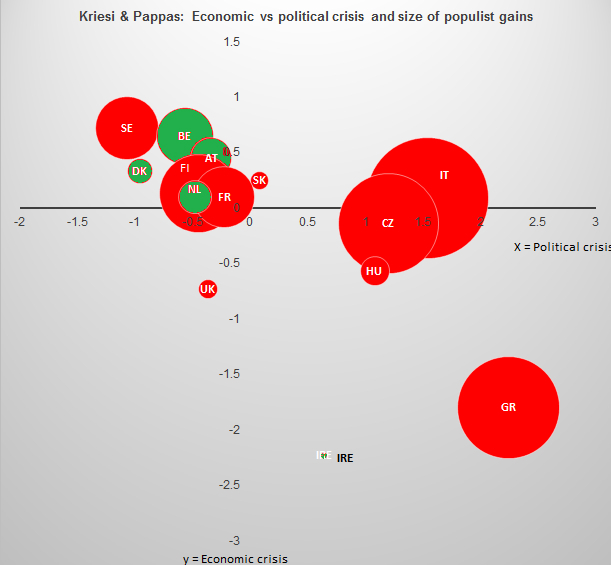 Although – with the striking exception of Ireland – populists gained most strongly where there was a convergence of high impact economic and political crisis, their growth cannot be primarily read as product of economic crisis. The apparent Irish anomaly can, as Eoin O’Malley and John FitzGibbon’s contribution discusses, partly be accounted for the electoral advances of the IRA’s former political wing Sinn Féin (SF), which serves as functional substitute for populist radical right and –left anti-austerity parties elsewhere. SF jumped from 4 to 14 seats in the Dáil Éireann and from 6.9% to 9.9% in the first post-crisis (2011) election in the Republic of Ireland and, polls suggest, could double this in next year’s general election. Despite this, populist gains seems interpretable more as the expression of a slow burning crisis of governance most marked in Eastern and Southern Europe. The relatively weak (although stronger than average) impact of the Recession in Italy does not prevent the rise of Northern League and the Five Star Movement (M5S) given the country’s ongoing governance and corruption problems which stretch back to the implosion of the traditional Italian party system in mid-1990s and beyond. Right-wing populists also make big gains in post-Recession elections in Sweden and Finland, where economic and political crisis indicators were relatively benign. Updating the UK with UKIP’s 2015 performance would also make the argument that solid democracy trumped bad economy in Western Europe weaker. But while the conclusion on the politics of crisis are clear, elsewhere the familiar, but still awkward and telling, issues of defining and classifying who is and is not a populist. Some ‘populist’ parties such as, for example, the Czech Republic’s ANO (ably analysed by Vlastimil Havlík) and some of smaller anti-establishment and anti—party groupings in Slovakia discussed by Peter Účen are missing the archetypical populist construction of the morally pure People, focusing more narrowly on under-performance of the established political class. Outsiders on the extreme (neo- or post-fascist) right which include elements of populism like Hungary’s Jobbik and Greece’s Golden Dawn are excluded – seeming because of their extremism – while other radical right parties with roots in a fascisant sub-culture such as Vlaams Blok, the Front National and the Sweden Democrats are included. Both Ireland’s mainstream nationalist and radical Irish Republican traditions are, inevitably, shot through with populist discourses, but – unlike dominant nationalist parties in Slovakia, Poland and Hungary– do not qualify as populist. The same, Takis Pappis and Paris Aslanidis’s chapter suggests, seems true of traditional Greek parties Pasok and New Democracy, although only new or formally minor parties such Syriza, the nationalistic Laos and the right-wing Independent Greeks are counted as populist for the purposes of the book comparative analysis. This might imply Syriza mattered because it was new, radical and anti-austerity – and a vehicle for new elites – but that its populism was just business-as-usual for Greek politics. Overall, it seems, ’populism’ is not just a coat of many colours, but occasionally a rather loose fitting one. In some ways this does not matter too. Comparative research is plagued with definitional difficulties or fuzzy, hard-to-classify cases. But it is hard to avoid the impression that the concept of populism is just too thin and too stretched to capture alike phenomena, embracing disparate movements and parties which have little (else) in common other than a shared meta-narrative of politics. The big populist parties (or populist gainers) in the cases in the collection range from sundry radical-right outsiders emerging from electoral marginality; long-established East European conservative-nationalist parties such Hungary’s Fidesz or Poland’s Law and Justice (PiS) ‘breaking bad’ in the wake of EU accession; a technocratic, top-down, reformist project party bursting onto the political scene like the Czech ANO – or the more genuinely grassroots anti-politics of Italy’s Five Star Movement. Such parties have such different origins, organisation, ideologies, levels of electoral support, policies and preoccupations, and implications for democracy. Sensibly enough, given its already ambitious scope, the collection does not stray into bigger questions of the implication of post-crisis populism for party systems or party democracy – whether diverse populist parties represent a form restructuring, even modernising, of democracy, or are a symptom of democratic malaise and dysfunction. The conventional (often usually implicit) wisdom is that populist parties – especially if they gain political power – are a problem to be ‘dealt with’ by mainstream parties, civil society, judiciaries or even political scientists. Although academic literature does, of course, weigh up the pros and cons of populism for democracy, arguing, for example, that, whatever their demerits, a populist surge can channel protest into democratic systems and give a voice to the excluded, the default expectation seem populists are in the main intolerant radicals and extremists or political chances, at the very least, inclined towards illiberalism because of moralistic understanding of politics rooted of a unified People. The chapters on Holland, Denmark and Norway on older, longer established right-wing populists highlight their (indirect) government role and (to an extent) moderation – dampening their electoral appeal – suggest that boundary between populist and non-populist may rather fluid. Moreover, as Zsolt Enyedi’s highly original chapter on Hungary notes, in ideology and political practice both Fidesz and far-right Jobbik as much illiberal elitists as populists: Fidesz is averse to all but the most stage-managed popular participation and combines national-populist stance with workfare and flat tax policies, which seek to demobilise and exclude large chunks of its citizenry. Jobbik is so ideologically radical that beneath a veneer of radical populism built from the usual elements anti-elitism, anti-Gypsyism and people-centredness, its leaders look to post-political and even post-national order inspired by the ideas of European New Right (Nouvelle droite) ruled by a ‘spirtual’ elite. In end, we may ask whether (and why) parties or politician are to some populist degree matters that much. More than their varying degrees or colourations of populist discourse, what seems to worry analysts most is that populist parties are outsiders, challengers to political establishments and established ways of doing thing purveyors of models of politics different from familiar and still comforting textbook models of historic West European party families. « East European democracy: Sliding back or hollowed out?